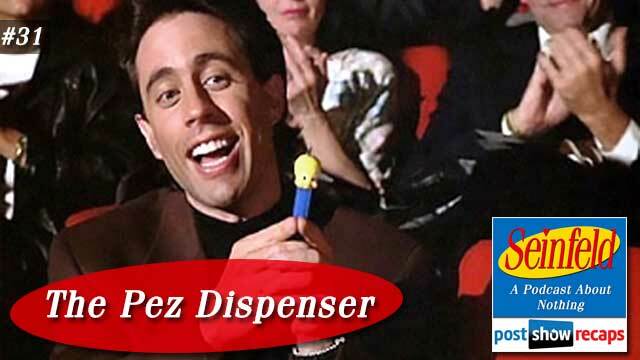 Despite their addiction to recapping the whole Seinfeld series, Rob Cesternino and Akiva Wienerkur trudge on and will not need an intervention before recapping “The Pez Dispenser”. This was the 14th episode of the third season, first airing on January 15, 1992. Rob was particularly happy with this one, while Akiva referred to it, as well as the next several upcoming episodes as interchangeable with ones from any future season. There was a bit of current news in the Seinfeld universe, with Howard Stern interviewing Larry David about his upcoming Broadway play, as well as all things Seinfeld. Akiva reported that there was no new information divulged, actually covering much of the topics in the Bill Simmons interview. Jerry’s opening standup is a bit about how women apply perfume. Rob found it different that Jerry was not wearing a suit jacket, but a sweater vest on stage. The first scene at Jerry’s apartment, has George going on about how great his new girlfriend Noel is. He does have issues with having no “hand” in the relationship. Rob and Akiva both shared that they don’t have “hand” in their marriages. George asks Jerry to go to her next piano recital in order to show Noel how he is around his friends, in hopes of taking back the hand in the relationship. Kramer comes in asking everyone to smell his arm, which smells like the beach after his polar bear plunge. He is infatuated with the smell, thinking it would make an excellent perfume. Rob and Akiva both agreed that taking the polar bear plunge is an exercise for crazy people. Kramer then gives Jerry a Pez dispenser, which he picked up at a flea market. They tease George because he thinks a flea market actually has fleas there. At the recital, George warns Elaine and Jerry about behaving themselves and what the right etiquette is for things like applauding. Akiva shared a story about an excruciating time at a piano recital when he was younger that was in his bottom ten life experiences. When the recital starts, Jerry puts the Pez dispenser on Elaine’s leg, which causes her to laugh uncontrollably, much to George’s chagrin. Rob likened the scenario to being at a somber place like church, where laughing is discouraged. Having to step outside to regroup, Elaine bumps into John, a bartender from one of Jerry’s comedy clubs. They talk about a mutual comedian friend Richie, who is hooked on drugs and in need of an intervention. John says that it would only work if Jerry were there, because Richie really respects him. When the concert ends, all three are outside of Noel’s dressing room, where George is upset at Elaine’s disruption. Elaine shares her encounter with John to Jerry, but George wants them to “cut to the chase”, since he has this Noel situation to deal with. Jerry agrees to host the intervention after hearing the story. When they go into Noel’s dressing room, she is distraught about the laughing during the recital, feeling it ruined the whole show. Jerry jokingly adds how rude it was for someone to do that. Elaine counters that a mentally unstable person must have done something to cause this woman to laugh, and that she’d apologize if she could, which causes George to start a slap fight with Elaine as Noel walks to the other room. George invites Noel out to dinner, but she is too upset to go, and grouchily sends George on his way. Back at Monks, Jerry shares a story about how Kramer indirectly turned Richie to drugs when they were all on a softball team together, by convincing Richie to dump Gatorade on the coach, who later died from pneumonia. Rob added that this story was based on a real life occurrence of Jerry and Larry. They go back to Jerry’s house, where he tells Kramer about the intervention, who wants in. Jerry gives him a name of someone in the cologne business to pitch his idea about the beach. George comes up quite upset over the impending breakup coming after a rough phone conversation with Noel, despite him having made notes for talking points. Kramer gives him the idea of a preemptive breakup, since George has nothing to lose anyway. George follows through with this idea, breaking it off. He makes a point to ensure she knows he is the one breaking it off, which seems to turn her on, changing their whole dynamic. Rob thought this was an excellent scene. In the next scene, Kramer is at Steve D’Giff’s office, pitching his beach cologne idea, and is not impressed with making something that smells like dead fish and seaweed. The scene cuts to Jerry’s apartment, where the intervention is about to happen. John is there hitting on Elaine with his nose plugged with tissue for his chronic nose bleeds, Kramer brings his polar bear crew, and George shows up unannounced with Noel, who he decided to stay with since he now has hand. While waiting for Richie to show up, there is some random conversation, where Steve D’Giff continues to call Kramer’s beach cologne terrible, despite George claiming he is a genius for his idea to gain the upper hand in a relationship. Rob and Akiva debated whether Steve was bluffing, and ran this idea to Calvin Klein as his own, or if George’s proclamation swayed him, since we learn in later seasons that the cologne is made without Kramer’s involvement. While the conversations continue, Noel overhears Elaine laughing, matching it to the laugh that ruined her recital. Elaine tries to deflect blame to Jerry, but Noel sees that George has been keeping this from her, and breaks up with him. Rob found it funny that these four characters will continually throw the others under the bus to save their own skin at any occasion. Richie shows up, but we learn in the next scene from Jerry what happened. He was standoffish at first, but seeing Jerry’s Pez dispenser triggered a story from his childhood that brought his life into perspective, resulting in him checking into a rehab clinic the next day, where he is doing great. Jerry finishes recounting the story, and George, doing the crossword, asks Jerry what a three letter word for candy is, which ends the episode. Rob though that this was a bit cheesy of an ending. Jerry’s closing standup was a bit about jawbreakers, that didn’t tie into the episode. Akiva and Rob both agreed that there wasn’t much to change in this episode if it aired in 2015, other than maybe they’d be able to play on their phone during the recital. Akiva and Rob starkly disagreed on the ranking of this episode. Rob called it his current favorite, while Akiva was not equally impressed, ranking it at 134. He thought while it was better than most season one or two, it just wasn’t terrific. There were a ton of emails and comments from last week’s episode, much to Rob’s delight. Johnny De Silveira wanted to know if they think there is a way to tell if a laugh is from a male or female. Both felt you can usually tell. Next there was an email from Katherine Smith, who wondered if they were keeping a running tally of how many times Jerry calls George Biff. They mentioned how that line was thrown in during this episode as a subtle callback to “The Subway”. Travis was not as high on the episode as Rob. He wonders why Jerry would have a Tweety Bird dispenser and not Superman, though he did feel we got the best of classic George. Rob pointed out that Kramer gave him the Pez dispenser, so he didn’t have a choice. Chelsea emailed asking if George should have asked for something better than just thinking about him all the time. Akiva said yes, that he should ask for all his meals to be delivered in bed. Ian Rice wanted to know how many times Jerry agrees to something even though he doesn’t want to. Rob and Akiva agreed that Jerry seems to do this all the time. Chester checked in with a few points. He wanted to know why Kramer was on the comedy club softball team. Akiva thought that he was brought in as a ringer. He also wondered why the guy who hated warm Pepsi was even on the episode, since he also asked to not say anything at the intervention. They agreed that his involvement in the episode was not necessary. Lastly, he asked if any of the polar bears were old time comedians. Akiva did some research, and learned that they were not. Tune in next week as the guys will recap “The Suicide”, where we will first meet Newman. Don’t forget to subscribe to the podcast by going to postshowrecaps.com/seinfeldITunes, where you can rate and review the podcast. You can get your questions to the guys by emailing[email protected], and follow them on twitter @robcesternino and @keev26.